Sebastian man steals two bottles of vodka from Wiinn-Dixie. 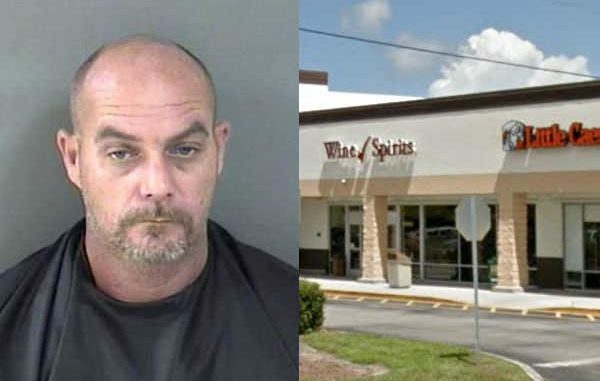 SEBASTIAN – A manager at the Winn-Dixie liquor store in Sebastian called the Indian River County Sheriff’s Office after a suspect stole two Smirnoff vodka bottles from the shelf. Brian Michael Chalker, 39, entered the store with two other individuals and immediately went to the vodka section while the others tried to distract the employee. The worker watched Chalker place two vodka bottles in his pants. She then called the manager. As Chalker was leaving the store, the worker asked him to lift up his shirt, which he only lifted the back before exiting. The store manager followed Chalker while the police were called. When Chalker noticed that he was being followed by the manager, he placed the two bottles in a garbage bin along Laconia Street near a Go-Line bus stop. Surveillance footage showed Chalker removing the two bottles from the shelf and placing them in his pants before exiting the Sebastian store. Chalker was arrested and transported to the Indian River County Jail where he was charged with two counts of theft.